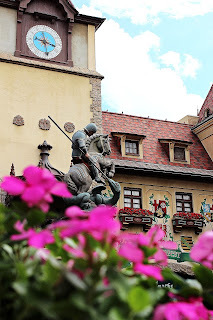 Kingdom Konsultant Travel Blog: World Showcase Spotlight: Germany! 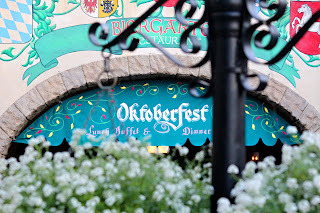 This month’s World Showcase spotlight features on of my personal favorite pavilions – Germany! I always seem to spend a little extra time in this part of World Showcase. The potted flowers throughout the pavilion, gorgeous architecture and the delicious smell of caramel treats make this an easy place to sit and relax for a little bit. The Germany Pavilion is home to a few stores where guests can buy everything from apparel and toys to steins and ornaments. Die Weihnachts Ecke is a must visit store for any Christmas lover. Hand blown glass ornaments of all shapes and colors decorate the walls and trees within the store. The pickle ornament tree is also a hit. Make sure to stop and read the story of the pickle ornament! Next door to Die Weignachts Ecke is Weinkeller. Guests can find German wines here, as well as wine accessories and even participate in wine tastings. Little ones can pick up that must have toy, doll or teddy bear at Der Teddybar store. Karamell-Küche is the place to be for anyone with a sweet tooth! This store features hand crafted caramel treats such as caramel popcorn, caramel apples, caramel covered cupcakes and gourmet candies featuring Werther’s Original Caramel. Yum! Along with great shopping choices, Germany is home to some great dining options, too! For guests, like my husband, who are looking for a cold brew, visit the Bier Stand for a beer and a hand twisted pretzel. Sommerfest is a quick service restaurant that offers bratwurst or frankfurter with sauerkraut and roll. This is another location within Germany to get an authentic hand twisted pretzel, beer or wine. For dessert you can enjoy apple strudel, black forest cake roulade or Bavarian cheesecake. Undoubtedly, one of the biggest draws into the Germany pavilion is Biergarten, the pavilion’s buffet style table service restaurant. The inside of Biergarten is made to look like a Bavarian village, complete with lampposts and trees. There is even a waterwheel and a moon shining from above! The seating style here is a bit different than most. The tables here seat eight guests at each, which means those with less than eight in their group could be seated with other guests. I didn’t mind sitting with other guests, I actually enjoyed meeting others! We were seated with a couple who lived locally and others who were from the Midwest. Along with the very detailed scenery inside of the restaurant, another immersive touch is the live band, Oktoberfest Musikanten. The sounds of alpenhorns, accordions and even cowbells are uplifting and sure to make your feet tap during your meal! Speaking of your meal, that’s what Biergarten is about! Biergarten is open for both lunch and dinner. Cold items such as nudel salat (macaroni salad), bayrischer kraut salat (Bavarian cabbage salad), senfgurken (mustard pickles) and what happens to be one of my favorites - gurken salat (cucumber-dill salad). For warmer dishes, try the eissbein-gratin mit gebackenen zwiebeln ( a pork shank-gratin with fried onions), schwaebische kaese spaetzle mit glacierten zwiebeln (cheese spatzle with glazed Onions) or the gebratene kartoffeln mit frischen krautern (roasted potatoes with fresh herbs) to start, along with an array of sausages and breads. To finish the meal, you must try the Bavarian cheesecake, it’s delicious! If you’re not a cheesecake lover, black forest cake, apple strudel, fruit salad and vanilla pudding with chocolate chips are some of the other dessert options available. Wine and beer is available as well. One of my favorite things to do is to check out the minature train set that has found its home in Germany. 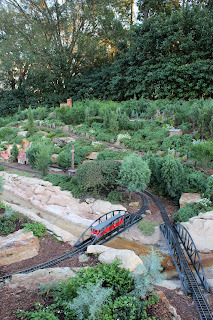 When visiting Epcot with my family growing up, we always had to set aside some time to visit the train set for my younger cousin. He would dash across the bridge that travels over the set so he was sure not to miss one chug of the toy trains. Even now I see kids (and kids at heart) doing the same thing. Be sure to take a few minutes to look at the details. The farmers, their animals, the townspeople in the village – it’s awesome. There are usually a couple of trains running through the small bridges and tunnels built into the landscape, so keep your eye out for them. It’s a great spot to slow down for a bit. Another think to keep your eyes open for when visiting Germany is Disney royalty. Snow White herself is known to visit with guests by her wishing well. Some day her prince will come! 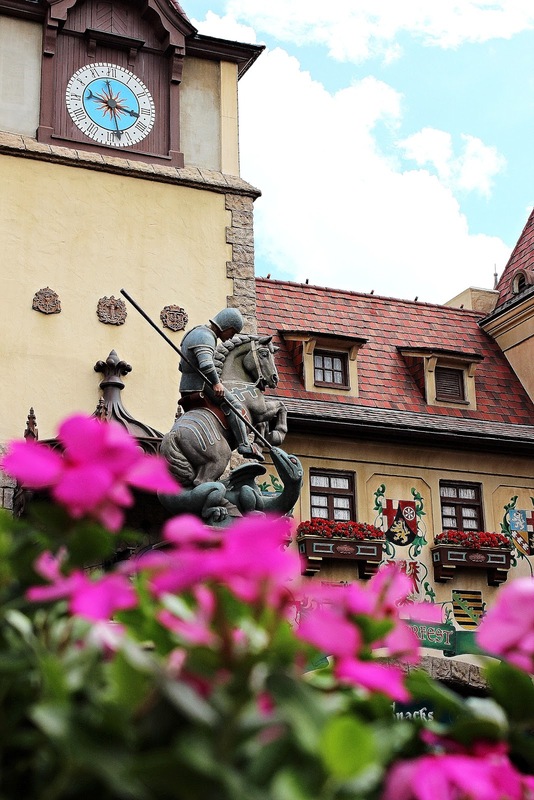 What is your favorite part about visiting the Germany pavilion?